In 2007 I bought a microscope and started with microphotography using my microscope and a web cam. As many programs that were available at low cost were not able to do what I wanted I wrote the program MICAM to assist me with taking photographs. In 2013 I bought a Canon EOS 600D and fitted that on my microscope. As MICAM was only suitable for USB camera's that use Direct Show to present a live view image to the user, I had to think of a different method to use my Canon camera. This resulted in DIGAM. 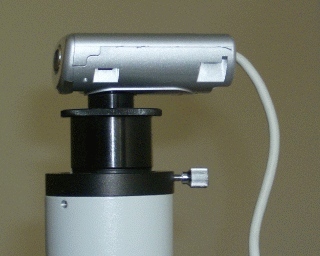 DIGAM uses a simple method to grab an image from the camera. The method is so simple, that I think it is applicable to other cameras as well. The problem for me was that I now had to maintain two programs, so if I came up with a new feature I had to implement it twice. As my spare time is limited I thought of a method of combining MICAM and DIGAM. Micam is a program that uses a webcam or dedicated USB Camera like the Tucsen series or other brands or a DSLR like the already mentioned Canon EOS. Probably it will work with any brand of DSLR that offers a way to remotely control the shutter and download the pictures immediately. I only have experience with the Philips ToUCam 840k, a Tucsen 3 Mp camera, and the Canon EOS 600D. All cameras work well with MICAM. Many users worldwide already use the previous versions of MICAM, so I think many brands of camera's can be used. I removed the lens of the ToUCam webcam, fitted an adapter on it and in front of the adapter came a IR-UV blocking filter. This way no dust can reach the CCD (I use a Philips ToUCam, because that web cam has a real CCD). My microscope is trinocular and the adapter can be connected very easy on top of the microscope with one screw (see picture). 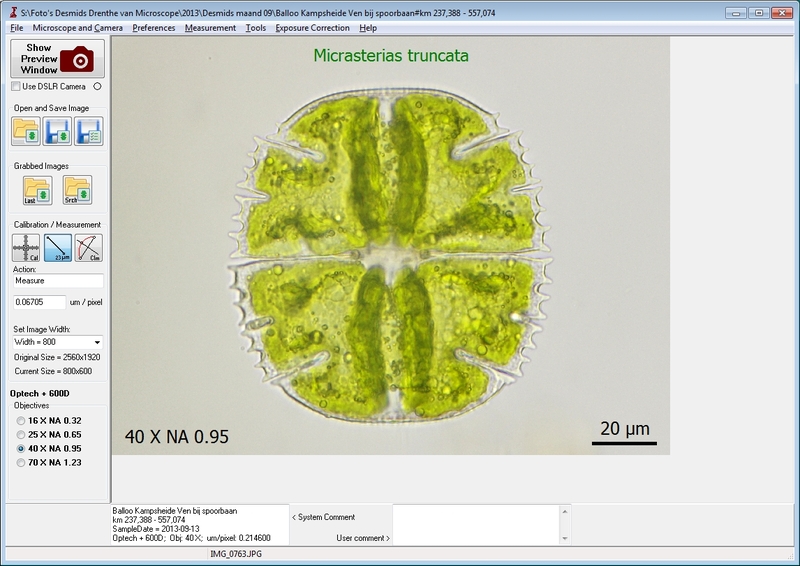 I think most people will have some more work to do to connect their web cam to the microscope. There is a lot of software to assist you with that, but I wanted the software to save the picture (or movie) without asking me questions about file-names. Also I did want to record the magnification factor (i.e. 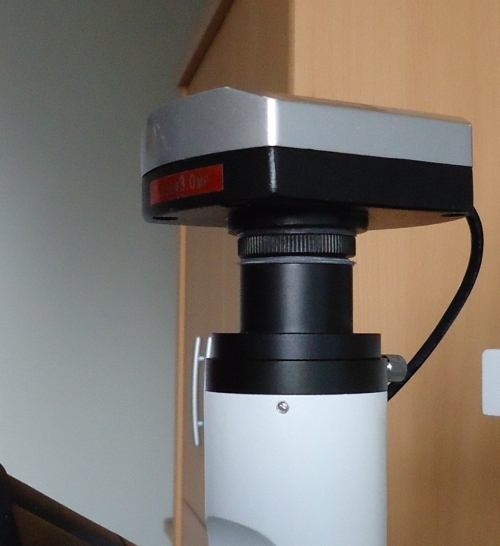 the magnification of the objective). I also wanted to measure structures on my photographs. Most software has no possibility to do that. 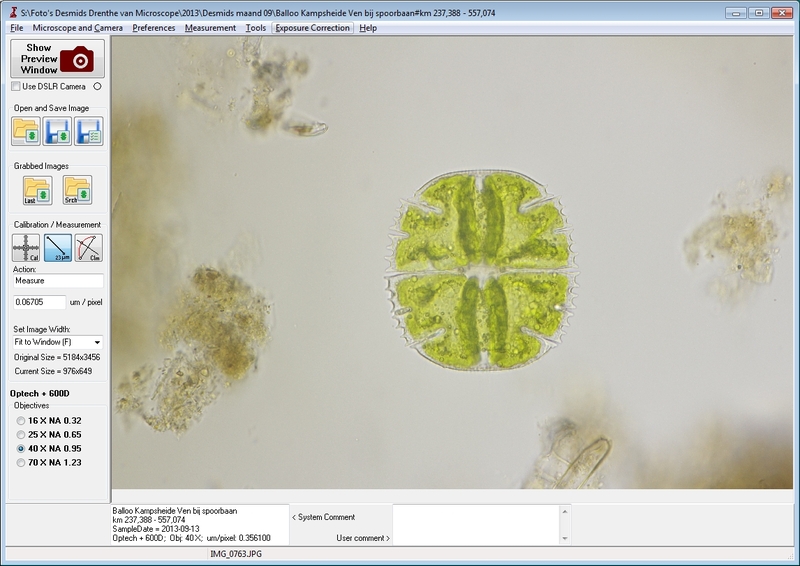 So I developed my own program that does what I want to do with my webcam and microscope. I also have a Tucsen 3Mp camera that I use without a relay lens. 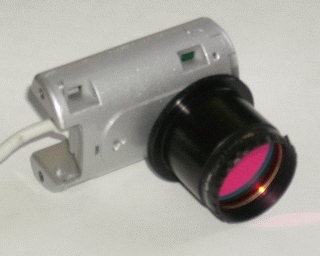 Due to the fact that there is no additional optics between the microscope objective and the sensor only a small part of the total image is displayed on the sensor. This can be a drawback when you want to make a photograph of an object that fills the whole visible area. But for small object I get very sharp pictures this way. Note: Normally you need a compensating eyepiece for many objectives to avoid coloured artefacts around the objects. As those artefacts are less obvious at the centre of the images the small field of view makes those artefacts less visible. 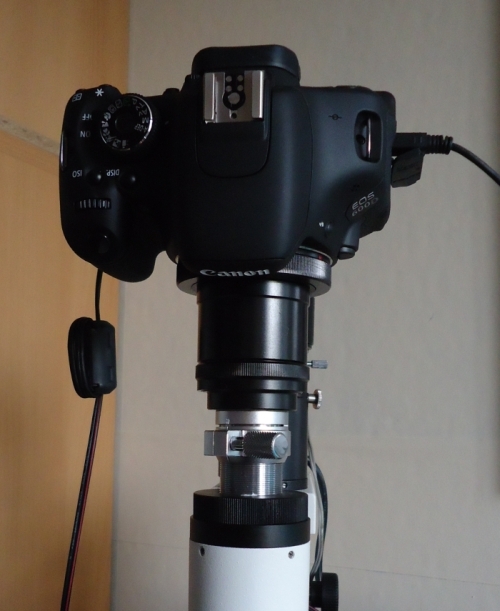 Many people use DSLR cameras on the microscope, so I also gave it a try with the Canon EOS 600D. I bought this camera because the Live View software comes for free with this camera. The first hurdle I had to take is finding the right eyepiece to have the largest field of view without distortion or chromatic aberration around the edges of the objects. Fortunately I had I box with some old eyepieces and it proofed that an old K7x created a wonderful image. 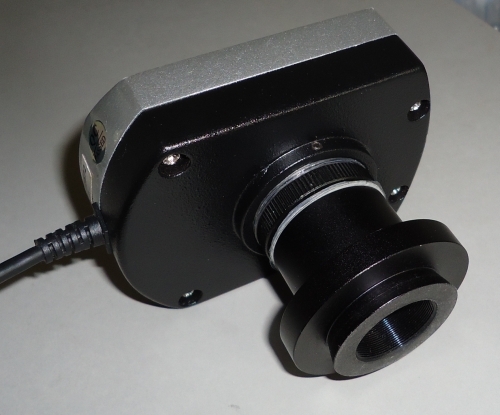 This eyepiece also has the option to move the eye-lens by means of a coarse thread. This was originally intended to focus a reticule in the eyepiece. In my case it enabled me to get increase the field of view by lifting the eye-lens about 1 cm. Now I have the largest possible field of view and no chromatic aberration. It would be nice if it was possible to open the image immediately in MICAM. So I tried to find a method to realize that. I stumbled upon a lot of problems, so finally I decided to do it in a different way: Let the Live View software store the image in a certain directory and then let my program detect the arrival of the image in that directory. 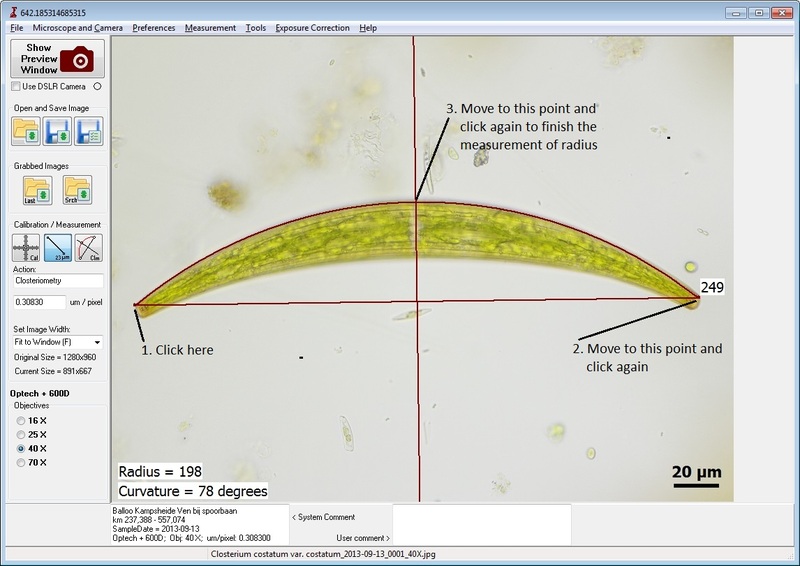 Open the image in MICAM and be ready to perform my measurements, do some cropping and save the result with a specific name. This way it would be possible for users of other brands of cameras to use the program as well. I hope that this is indeed possible, because I have no way to check this. Cropping images to a convenient size. The use of short-cut keys, to make operating MICAM as easy as possible.